Susan Moeser performed this program as the opening recital of the Region VI Convention of the American Guild of Organists in Omaha, Nebraska, on June 29, 1999. The organ of two manuals, 22 ranks, and 24 stops is placed in the large and resonant space of St. Vincent de Paul Church where its eclectic resources reside in a west gallery and the console is located below the gallery on the nave floor. Completed in late 1998, the instrument features mechanical key action of the manual keys and electropneumatic stop action and pedal key action. The manual trackers pass beneath the console platform, rise 20 feet to the organ gallery above, and attached to the Great and Swell windchests. A combination action aids the control of stops. The Great is largely in Germanic style and the Swell is strongly French in character. Susan Dickerson Moeser received the DMA in organ performance at the University of Kansas. Recipient of First Prize at the 1983 Fort Wayne National Organ Playing Competition, she is a noted concert organist and workshop leader. She has served on the music faculties of the University of Nebraska-Lincoln, Penn State University, Susquehanna University, Emporia (Kansas) State University, and the University of Montana. She also served as organist and choirmaster of Second Presbyterian Church, Richmond, Virginia, 1984-87. 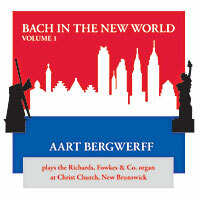 First and only recording of these organ works from the BWV -- not "Neumeister" and not "Rudorff"!